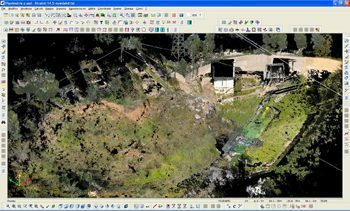 Project can be executed directly by using points cloud from wich project axes are defined with direct extraction of longitudinal profiles and cross sections, by setting appropriate selection parameters (tolerances for the points inclusion, minimum distances between them, etc..). Alternatively, you can calculate the terrain model detected (DTM) before executing the project. For this purpose, you can automatically create a grid of equally spaced points, interpolated directly on the cloud detected. On grid, defined by user, it will be possible to interpolate the model, by using the calculation algorithm specific for this type of application.